A view of Lake Yunoko (湯の湖) and the hot spring hotels of Yumoto (湯元), near Nikko in Tochigi Prefecture. Hemmed in by mountains, there barely seems enough place for both a lake and a spa resort, but they did somehow manage to squeeze themselves in. Yumoto’s sulphur baths have attracted weary travelers and people hoping to heal their body and soul for many centuries, and still do so today. Priest Shodo (勝道上人, 735-817), who founded the two temples which became the origin of Nikko, is said to have found the hot spring in 788. He called it Yakushiyu (薬師湯, doctor’s hot spring). During the 14th century, it became extremely popular with aristocrats. The village was not always called Yumoto. Before the area received its current name, it was called Futarasan Onsen (二荒山温泉), after a nearby mountain. Yunoko actually means hot water lake. It was called so because water of the hot spring flows into the lake. The water of the lake in its turn feeds the beautiful Yudaki Falls (湯滝) before turning into the Yukawa River (湯川). Interestingly, women were not permitted to use the hot spring until the Meiji Period (1868-1912). According to ancient Shinto beliefs, they were believed to be unclean. This seems to suggest that the hot spring was considered sacred. There is scarcely room between the lake and the mountains for the picturesque village with its trim neat houses, one above another, built of reddish cedar newly planed. The snow lies ten feet deep here in winter, and on October 10 the people wrap their beautiful dwellings up in coarse matting, not even leaving the roofs uncovered, and go to the low country till May 10, leaving one man in charge, who is relieved once a week. Were the houses mine I should be tempted to wrap them up on every rainy day! I did quite the wrong thing in riding here. It is proper to be carried up in a kago, or covered basket. A Nishikie (錦絵) published in 1879 (Meiji 12), which is just a year after Bird visited, shows ten inns in Yumoto and not much else. It really was a very small place. A detail of the above image shows the onsen hotels. 1 Bird, Isabella L. (1911). Unbeaten Tracks in Japan: An account of travels in the interior including visits to the aborigines of Yezo and the shrine of Nikko. John Murray. 2 For tourist information about Yumoto Spa, visit the official site of the Nikko Tourist Association. You can also licence this image online: 70606-0005 @ MeijiShowa.com. Very interesting. I have never been to this area of Nikko. I have been to the Senjogahara Plateau. The village doesn’t look like this at all anymore, I am afraid. Concrete and asphalt have intruded here as well. But the mountains, lake and falls are still spectacular. 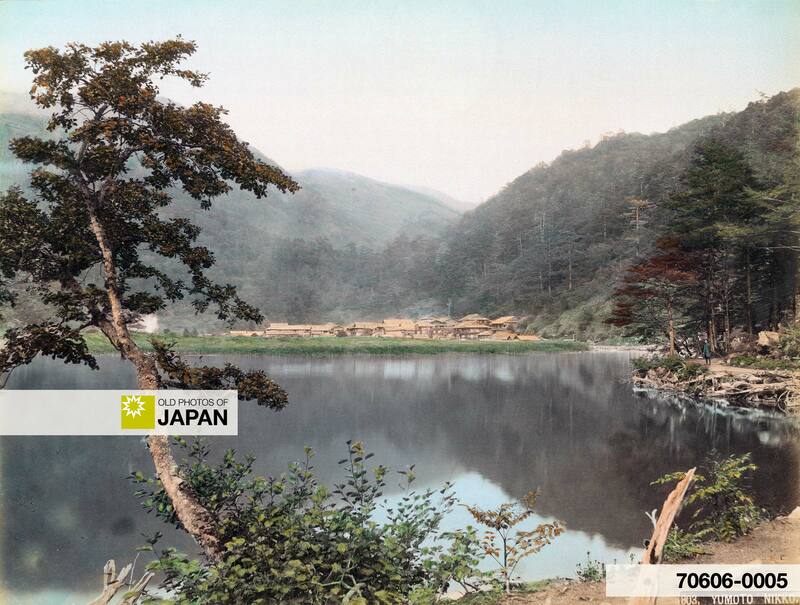 I purchased an old handcolored photograph that is labeled “J 18, Yumoto, Nikko”. It appears to be a slightly different shot of the view of Lake Yunoko and the hot spring hotels of Yumoto. My guess is that the protographer was positioned to the right to the shore line in the photo you show above. Can you tell me if it is also by Kimbei Kusakabe? Is there any record of the photo? @Robert: I checked Terry Bennett’s Collectors’ Data Guide and it has no listing for J 18, Yumoto, Nikko. J 18 differs from Kimbei Kusakabe’s numbering system, so I am pretty sure that the photo is not by him. According to Bennett, there is actually still a lot of uncertainty about photo numbers starting with letters. Maybe you can show me a link to a scan of your photo, and I’ll have a look.